The RUNNIN’ LOPES BOOSTER CLUB is a 501(c)(3) non-profit organization created by fans and supporters of our College. It is the goal of the RUNNIN’ LOPES BOOSTER CLUB to encourage community & college collaboration and by highlighting and advancing LCC’s athletic programs. We plan to have a number of membership events, meetings, and fund raisers throughout the year. All proceeds from the Club will go directly to LCC for athletic scholarships and expenses and benefit all sports. LCC’s administration is grateful for the Booster Club’s promotion of and assistance to LCC Athletics. The Lamar Community College Athletics department is grateful to the many alumni, donors, fans and friends who support the Lopes each year. One of the most important qualities of any intercollegiate athletic program is integrity. As a member of the National Junior College Athletic Association and the Region IX Conference, LCC has a responsibility to educate administrators, coaches, student-athletes and other representatives of institutional athletic interests about the rules that could affect their association with the program. 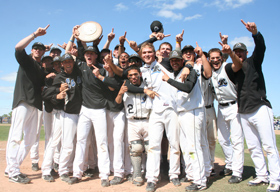 Runnin’ Lopes Athletics is striving to remain in compliance with the guidelines of the NJCAA and Region IX. You are a representative of Runnin’ Lopes Athletic interests! As a supporter of Runnin’ Lopes Athletics, you and your involvement are greatly appreciated by the administration, coaching staff and student-athletes. We encourage you to attend as many events as possible, introduce Runnin’ Lopes Athletics to friends and business associates, support our fund-raising efforts, and consider student-athletes for summer employment. However, as important as your assistance is to the program, it is equally critical to know that the college and its athletic program could be jeopardized if you unintentionally or intentionally violate NJCAA or Region IX regulations. Maintaining institutional control over the administration of the Lamar Community College Athletics program, including recruiting, is our highest concern. Compliance is a fundamental requirement of LCC’s membership in the NJCAA and Region IX. As a supporter of Runnin’ Lopes Athletics, you are bound by NJCAA and Region IX regulations, and LCC is responsible for your actions. Failure to comply with NJCAA and Region IX rules could result in severe penalties or sanctions against LCC’s athletics programs and its student-athletes. You may provide a student athlete or an entire team with an occasional meal (e.g. Thanksgiving, Christmas). All arrangements must be made in advance with the athletic director and head coach. For more information, contact LCC Athletic Director Scott Crampton at scott.crampton@lamarcc.edu or 719.336.1681.